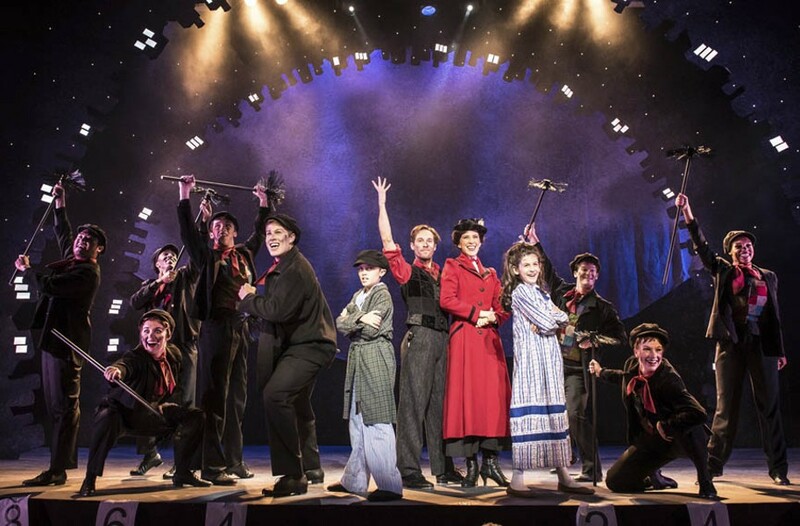 Virginia Repertory’s “Mary Poppins” is Theatrical Magic at Its Best | Theater | Style Weekly - Richmond, VA local news, arts, and events. Aaron Sutten Jack Hensley, Morgan Reynolds, Stacey Cabaj and Anya Rothman do an exceptional job as the main cast of the crowd-pleasing “Mary Poppins” at Virginia Repertory Theatre. "Mary Poppins," the magical dream nanny so many of us have known and loved since childhood, has floated into town, and audiences of all ages are in for a delightful experience this holiday season. This Virginia Repertory Theatre production is just as whimsical, magical and fun as the classic 1964 Disney film, with all of your favorite songs. But it is also a distinct and special show in its own right. The stage play doesn't depend upon the movie musical for its appeal, and the narrative feels much more complete with an emphasis on the family dynamics in the Banks household. Some elements of the play that weren't in the film might be familiar to anyone who read P.L. Travers' series of Mary Poppins novels that preceded and inspired the film. It's a deeper look at this familiar story, with just as much magic and spectacle as you'd expect. In short, this production, much like Mary Poppins herself, is "practically perfect in every way." Upon entering the theater, the first thing audiences will notice is Brian Prather's fantastic set design, with a period-appropriate art nouveau feel. There are backdrops featuring fluid watercolor trees and a circular frame reminiscent of those found in Alphonse Mucha paintings. Both interior and exterior spaces are represented expertly, including the Banks' lavish home and the city rooftops where chimney sweeps dance and magical winds blow. B.J. Wilkinson's lighting design accents everything perfectly, sometimes playing an important role in selling the special effects. In a play with so many fantastical elements, the special effects are important, and Todd Schall-Vess' illusion design meets that challenge again and again. Audiences are in store for many whimsical surprises, including statues and toys that come to life and a flying umbrella, thanks to ZFX Flying Effects. to whisk Mary Poppins away when the winds change. The cast of this show is populated with exceptional talent. Stacy Cabaj is enchanting as Mary Poppins, and Morgan Reynolds is instantly endearing as Bert, the chimney sweep with a magic of his own. Young actors Anya Rothman and Jack Hensley are perfect as bright-eyed kids Jane and Michael Banks. John Moon is stern but likable as their distant father, George Banks, and Andrea Rivette steals a scene or two in her role as put-upon mother and wife, Winifred. Other notable performances include Robyn O'Neill as the Bird Woman and Debra Wagoner as Miss Andrew. Derrick Jaques demonstrates his versatility in a variety of roles throughout the show. Chase Kniffen is a director who knows just what to do with a talented ensemble, and he plays up the whimsical, fantasy elements of each scene. Lisa Rumbauskas' choreography is lively and intricate, and I really enjoyed the way each musical number seemed to end with a well-composed tableau. Sue Griffin and Jeanne Nugent have designed costumes that feel period appropriate yet dreamlike, adding visual interest and movement to each scene and dance number. John Winn's musical direction is perfect, but it shines brightest during the big musical numbers, of which there are many. Some of my favorites included "Jolly Holiday," "A Spoonful of Sugar," "Supercalifragilisticexpialidocious," and "Step in Time." "Feed the Birds" will bring a tear to your eye, but my favorite song in the show, and my favorite scene, by far, is one you won't see in the Disney film at all. "Brimstone and Treacle Part 2" features a battle of the nannies, as Mary Poppins shows up to rescue the Banks children from the mean and restrictive Miss Andrew who'd like to fill them to the gills with cod liver oil.